This Safety Alert (SA) has been published to highlight a possible safety issue with early models of Grundfos CONLIFT condensate pumps, produced on or before week 47 of 2007. This recall DOES NOT affect CONLIFT1 LS, CONLIFT1, CONLIFT2, or CONLIFT2 pH+ models. Grundfos CONLIFT is a series of professional range compact condensate removal pumps that are installed both in commercial buildings and private households. These products are used where condensate cannot drain naturally or when the condensate source is located below the backwater level. The typical application is the removal of condensate from condensing boilers, chimneys, air-conditioning, dehumidifiers and refrigerators. This only affects models of CONLIFT pumps manufactured during or before week 47 of 2007. Pumps from that period may pose a dangerous fire risk under certain circumstances. Grundfos has discovered under certain technical conditions, including the use of household fuses above 10A, the motor an early model of the CONLIFT pump (produced up until week 47/2007 inclusive) may overheat, which may in turn cause the pump to catch fire. Figure 1 – shows a photograph of the affected pump. 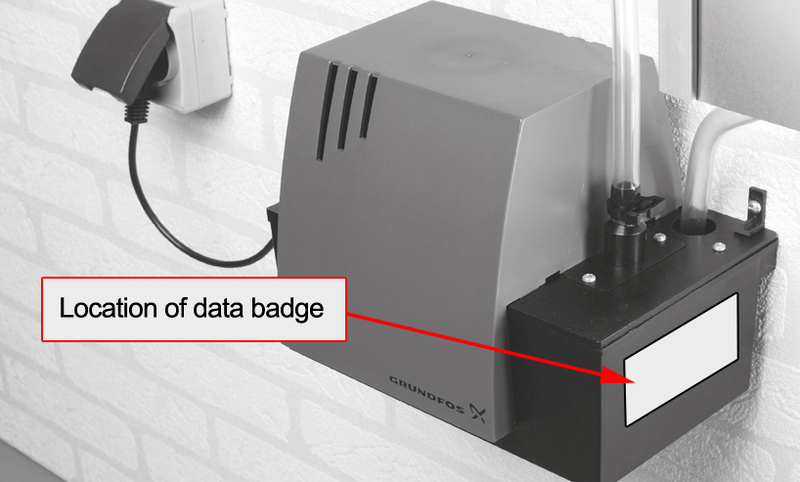 Each pump is fitted with a data badge located on the side of the unit. Figure 2 – shows an example of a data badge where the date of manufacture is circled. The first two numbers indicate the production year and the last two numbers indicate the production week.